While there are many hotel is Rome, I recommend renting with a service like Airbnb or Homeaway; when traveling abroad, my family and I have always had good luck staying in these types of rentals. This time, we opted to stay at an Airbnb apartment near Trevi Fountain. My sons, ages 11 and 15, appreciate having their own space, and I appreciate having a fully-equipped kitchen to prepare simple meals when we don’t feel like eating out. I’d highly recommend a central location in Rome. We were just a few blocks from a metro stop (Barberini) and within walking distance of many of the major sights. Italy has so much to offer families. Here’s a 3-day itinerary for Rome that’s been road-tested by my family. What to do & where to eat? We’ve traveled to several European cities, and our favorite activity on the first day of any trip is always a bike tour to help us get the lay of the land. We’re all avid bikers, and I’ve found bike tour companies able to accommodate kids of all ages and sizes. In Rome, I’d recommend TopBike Rental and Tours. While the company offers several tour options, we selected the Rome in One Day tour since it covered a lot of ground and included lunch. Plus, the idea of having our first day fully planned by someone else was very appealing. The TopBike office is close to the Colosseum and just a short walk from the Metro Red Line. Our English-speaking guide, Bruno, hooked us up with electric-assist bicycles. The electric-assist bikes were a hit with our kids and made the hills a breeze; yes, Rome is surprisingly hilly! When the battery on my bike went out, a TopBike employee delivered a new bike to me just a short time later. The tour route wove through charming and less crowded backstreets to avoid dangerous traffic. The tour started with a view of the Colosseum from Fagutal Hill and then proceeded to Vittorio Emanuele II Monument (aka the wedding cake or the typewriter), Trevi Fountain, Spanish Steps, Popolo Square, Borghese Gardens, St. Peter’s Square, Trastevere, Jewish Ghetto, and Capitoline Hill. Our guide Bruno spoke excellent English with a charming Italian accent. He was very knowledgeable about the city and Italian and Roman history. Among many other things, we learned about how the water fountains around Rome provide drinkable water, what kind of impact Mussolini had on Rome, and how the Pope had an escape route from the Vatican to the Castel Sant’Angelo. Bruno was attentive and engaging with my two sons, asking them questions and involving them in discussions along the way. There were a few Italian folklore stories that they especially enjoyed but are a bit too graphic to include in this article! KidTripster Tip: If it happens to rain during your tour (like ours), no worries. TopBike provides ponchos to keep dry. We stopped for a relaxing and well-deserved lunch at a trattoria, selected by Bruno. We were treated to a plethora of Italian specialties like bruschetta, frittata, pea and artichoke salad, and fried mozzarella. And those were just the appetizers! We each managed to polish off our own pasta dishes, as well. Towards the end of the tour, we stopped for gelato, a ritual which was to repeat itself daily… ok, sometimes three times a day! Yes, the gelato in Italy is that good (and also very inexpensive)! The treat energized us for the last stretch. At the top of Capitoline Hill, we were treated to the most gorgeous view of the Roman Forum and all the surrounding ruins, gleaming in the late afternoon sunlight. KidTripster Tip: Though gelaterias are on every corner, avoid the ones with gelato piled high in neon bright colors and with crazy embellishments; they do that specifically to attract children and tourists. Instead, look for the less touristy shops with gelato in natural colors. The best shops will often keep their gelato stored under lids for optimal freshness. Cost for the Rome in One Day tour: around $121/person, depending on the current conversion rate. The price includes lunch and gelato. After a tour with TopBike, I’d suggest strolling up Via Labicana to take photos of the Colosseum in the evening light and then dinner at a neighborhood restaurant like Urbana 47 in Monti. After all, you’ve earned another nice big bowl of pasta! KidTripster Tip: Avoid engaging with any of the street vendors near popular sights who try to offer you free merchandise. We had a very friendly one give my son a “free” bracelet (which we tried to refuse) only to have him show up behind us several blocks later and demand money. If biking isn't your thing, consider a walking tour with a local guide through Free Tours by Foot. You pay what you think the tour was worth. Since you got an overview of Rome on your first day, Day 2 is about exploring more deeply. We chose to explore the Vatican. We booked a Privileged Entrance Vatican Tour including the Sistine Chapel with The Roman Guy. When walking from the Metro to the tour meeting spot, you’ll undoubtably notice the hoards of people along with random vendors on every street corner asking if you need a tour ticket. Keep moving until you find your guide; our guide was named Elleanora. Our tour promised to “skip the line and enter a full hour before the general public.” While we did skip the general public line and entered before opening time, there were many other tours doing the same thing, so it was still a crowded experience. I was happy not to stand in the longer line with the general public and having a tour guide navigate the museums and explain all the artwork was well worth the price. I’m sure that navigating it all on our own would have ended in frustration, and we undoubtably would have missed a lot of historical details and context. The tour starts with a walk through the vast Vatican museums with their countless paintings and sculptures. Popes of the past ordered that the “private parts” on the artwork be covered with fig leaves or cloths because they were considered too obscene. Elleanora was able to keep the attention of my 11-year-old son (who was feeling a little grumpy and sleep-deprived) by showing him artwork that he could relate to, like the sculpture that looked like the Death Star from Star Wars. KidTripster Tip: While my younger son did pretty well on this 3-hour tour, The Roman Guy offers an express, 2-hour Vatican tour which may be better suited to families with younger children with short attention spans. We were able to view Michelangelo’s frescos on the ceiling of the Sistine Chapel. I was actually surprised at how small the chapel is, especially in comparison to St. Peter’s Basilica. We were all awestruck with the level of detail in the paintings and amazed at the length of time and physical pain Michelangelo endured while creating them. The ceiling here appears 3D, even though it’s definitely 2D. The Sistine Chapel is the room in which new popes are chosen. Elleanora, our guide, showed us burn marks on the ground where the stove that emits the colored smoke (that signals a new Pope) sits. After the Sistine Chapel, we explored the huge and awe-inspiring St. Peter’s Basilica. We learned that the half-circle columns on both sides of St. Peter’s Square are meant to represent outstretched arms in a welcoming hug to all that enter. KidTripster Tip: After the tour, go to the Vatican post office and send postcards from the world’s smallest country. Yes, the Vatican is considered to be an actual country. Cost for Privileged Entrance Vatican Tour: Youth (5 & under) Free; Youth (6-17) around $85; Adult around $104, depending on the current conversion rate. If you decide to visit the Vatican on your own, purchase your tickets online in advance to avoid the longest lines; audio tours are available in several languages. After the Vatican tour, we had a delicious lunch at La Zanzara Bistrot, a cafe located just a few blocks from the Vatican. KidTripster Tip: We are big food enthusiasts and did our homework before departing for Italy. We downloaded Elizabeth Minchilli’s app, Eat Italy. Minchilli is an American foodie living in Rome. In addition to giving great dining recommendations, you can use the app to find a nearby eatery while you’re wandering around. This app came in handy after our tour of the Vatican, as we were starving and lost in a minefield of touristy restaurants. Thankfully, we were able to locate a vetted cafe nearby. KidTripster Tip: I purchased an international phone package including 1 GB of data through my wireless carrier. Having the ability to use Google maps saved us on many occasions, especially when walking around the city. It was well worth the cost of $60. Alternatively, you could download maps when you have access to free WiFi. KidTripster Tip: Bring a folding scooter, like a Razor (boxed from the store) for any energetic youngster to use while in Europe. With all the walking, a scooter for those with shorter legs makes sightseeing easier and more fun. My son was thrilled to tour on his own wheels. However, with all of the cobblestones, the scooter was a bit more challenging to use in Rome compared to other cities like London and Paris. If you don't think your kids are up to a tour of Vatican City, consider delving deep at the Colosseum. The Roman Guy offers a tour that includes the underground tunnels, cages, and cells. For dinner that evening, we dined at Colline Emiliane, located a few blocks from Trevi Fountain. This restaurant is known for its handcrafted pasta. 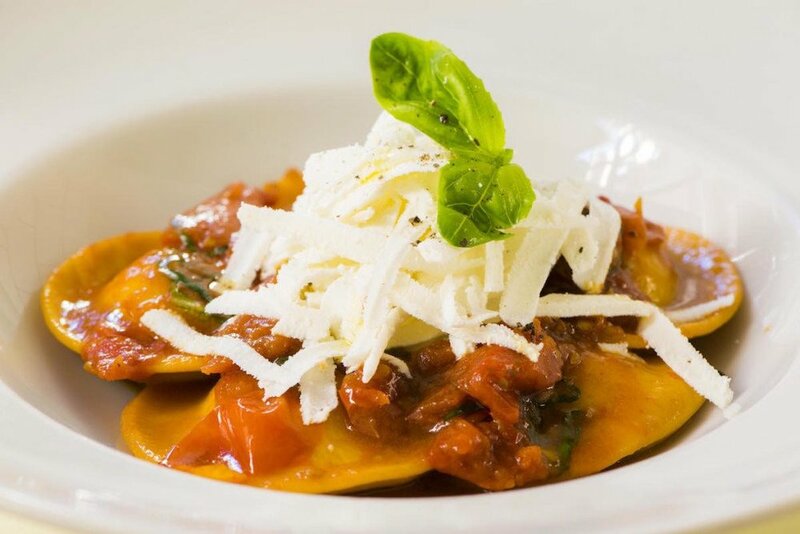 I had the delicious, pumpkin-filled tortelli di zucca, while my son devoured an amazing tagliatelle alla bolognese. For dessert, we shared a budino al cioccolato, a creamy chocolate custard. KidTripster Tip: I actually planned out dinners for each night based on location. Most of these highly-recommended restaurants (again, consult the Eat Italy app) had websites, so I easily made reservations in advance. Having a nightly planned dinner provided structure to the day, ensured that we had a quality meal, and helped us avoid last-minute missteps. 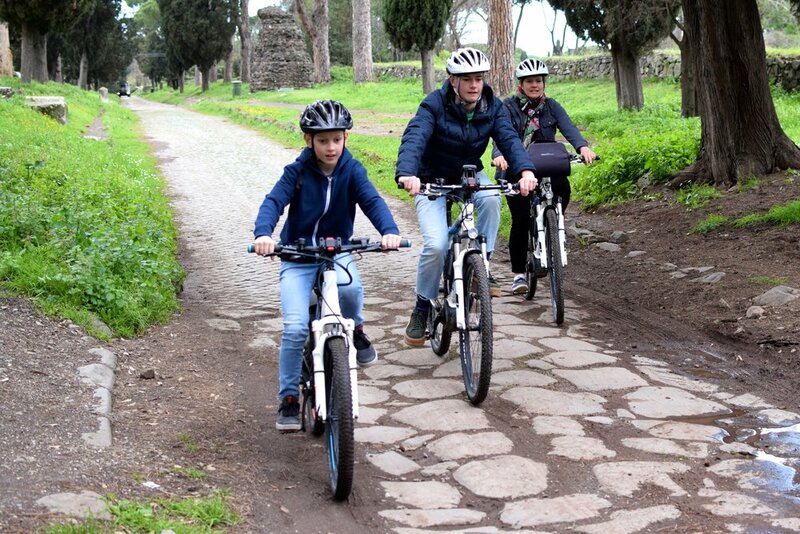 Our bike tour on the first day did such a good job of covering the major city sights that we decided to venture into the Roman countryside on the Appian Way, the world’s first highway, on our last day in Rome. We returned to TopBike Rental and Tours to rent four, electric-assist bikes for a self-guided tour. Even though we examined a paper map and Google Maps on my phone, we still managed to get lost! But, it’s all part of the adventure. KidTripster Tip: Since my family and I have a lot of experience on bikes, we felt comfortable riding on the streets of Rome. We tried to choose quieter backstreets, but at one point, when trying to figure out how to cross from the Colosseum, pass the Circus Maximus, and onto the Appian Way, we were forced to ride along taxis and buses on a busy street. I find that when you act like you know what you’re doing, cars make room for you; the same was true here. However, I only would recommend this self-guided tour for families with older kids who have experience road biking. The Appian Way is a cobblestone road that goes for many miles. In several areas, the “cobblestones” are actually large round rocks that are quite bumpy to navigate. Along the way, you’ll find ancient villas, ruins, and scenic countryside. At one point, our ride was halted to make way for a herd of goats crossing the road in single file; there must have been a hundred or more of them! With two active boys, exploring in this way really suited our family. My wheelie-popping, 11-year-old jumped off every curb that he could find. During the ride, we came across a small store and cafe. We ordered a couple of ham and cheese paninis and two chocolate Nutella tarts that we washed down with some Cokes. Again, it was a well-deserved meal! That evening, we went shopping around the Spanish Steps and enjoyed a very memorable meal at Roscioli. It’s a cozy “salumeria” (deli) located near Campo di Fiori. We sat at the counter surrounded by walls of wine, condiments, and hanging meat. The server kept us well supplied with warm and salty focaccia bread, which we all loved. The deli is known for its pasta carbonara, perfectly al dente, cheesy, and salty. It’s a meal that I continue to dream about to this day. KidTripster Tip: Though most Italian restaurants serve pasta not all serve pasta sauce-free. Our servers were willing to accommodate my butter-and-pasta-only child, but make sure you ask for buttered pasta not buttered noodles (“Noodles are for China,” one server told us). Parmesan cheese is always provided as a condiment. 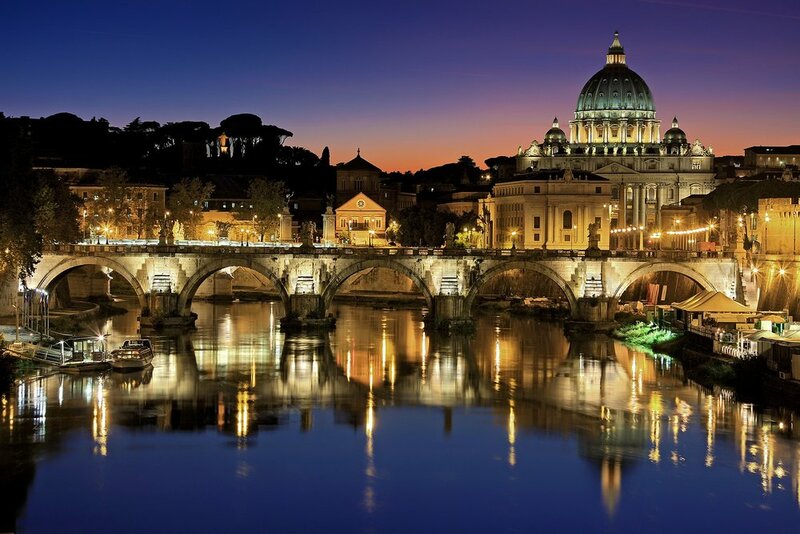 If you have an extra day in Rome, consider exploring some of the neighborhoods such as Trastevere or Monti or the area around Campo di Fiori. You’ll fly into Leonardo da Vinci–Fiumicino Airport, which is about a 40-minute drive outside of central Rome. We pre-arranged pickup at the airport with Welcome Pickups. Cost: about $85/one way, but it varies based on distance, number of passengers, and amount of luggage. After a long day of traveling (with the accompanying jet lag and brain fog), it was nice to have a driver waiting for us. While in Rome, it’s easy enough to get around on foot or via the Metro. Uber also is readily available. We took an Uber to the car rental office on our last day, as we rented a car for the drive to Florence and beyond. If you're feeling adventurous and rent a car to drive in Italy, go with the flow. Italians don't drive like Americans; they are more aggressive but without the road rage. KidTripster Tip: Have a good app for directions. Google Maps on my phone did the trick, but be sure to beef up your wireless plan. Also be sure to study maps of the ZTL (Zona Traffico Limitado), where you’ll get a hefty ticket if you enter. We coordinated with our hotels and Airbnb hosts to get these charges reversed, since we were staying within the ZTL. Amber Connell is a wife and mother of three, who lives in Portland, Oregon. She enjoys seeking out culinary specialties in every new place that she visits. This writer received a complimentary tour for the purpose of this review. However, all opinions expressed are solely her own.